Cranberry juice has several benefits for your body, but too much can counteract these beneficial effects. You can purchase 100 percent cranberry juice or cranberry juice cocktail, which usually contains less than 33 percent actual fruit juice, meaning it may not have the same benefits as 100 percent juice. Enjoy a glass of 100 percent cranberry juice here and there, but don't go overboard by consuming more than the recommended servings. You need a total of 1 1/2 to 2 cups of 1-cup equivalent fruit servings for the entire day, suggests MyPlate.gov. An 8-ounce glass of 100 percent cranberry juice counts toward your daily fruit servings; however, it is possible to consume too much. Having more than the recommended servings can eventually lead to health problems. Limit your total cranberry juice consumption to less than 1 liter per day, says Medline Plus. Drinking 1 liter of cranberry juice is equivalent to about 34 ounces or a little more than 4 cups, more than double your fruit servings for the day. If you consume more than 1 liter daily for an extended period of time, you may have an increased risk of kidney stones. Cranberry juice contains a chemical called oxalate that binds with calcium, possibly forming stones in your kidneys when you drink large quantities of cranberry juice. If you have a history of kidney stones, avoid consuming too much cranberry juice by limiting your consumption to two 8-oz. servings or less daily. Reaching or going above the daily limit of cranberry juice can drastically increase the number of calories you consume. An 8-ounce glass of unsweetened 100 percent cranberry juice provides about 115 calories. Drinking the 1 liter daily limit of juice provides as much as 460 calories or more. If you normally follow a 2,000-calorie diet, this equates to nearly 25 percent of your total calories for the day, just from juice. Over time, these added calories can stack up unwanted pounds. Having a glass of cranberry juice each day may be beneficial for your bladder. 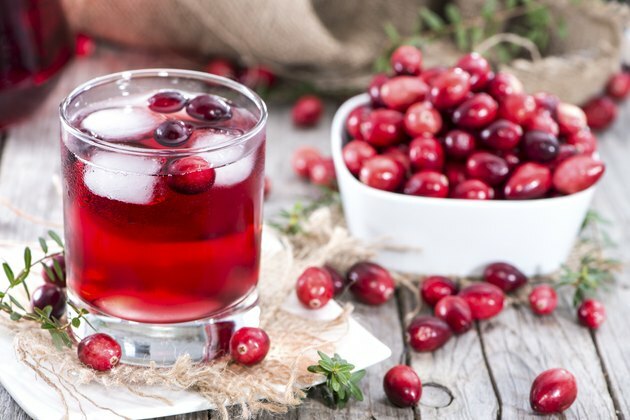 Cranberry juice may help prevent or treat urinary tract infections by preventing harmful bacteria to sticking to the walls of your bladder, explains MedlinePlus.com. Urinary tract infections, or UTIs, cause pain when you urinate and may make it difficult for you to go to the bathroom. While moderate consumption of cranberry juice may be beneficial for a UTI, you need to see a physician to get an exact diagnosis, since it may need to be treated with antibiotics.